Mitchell Santner smashed a last-ball six to seal the deal for defending champions against Rajasthan Royals. 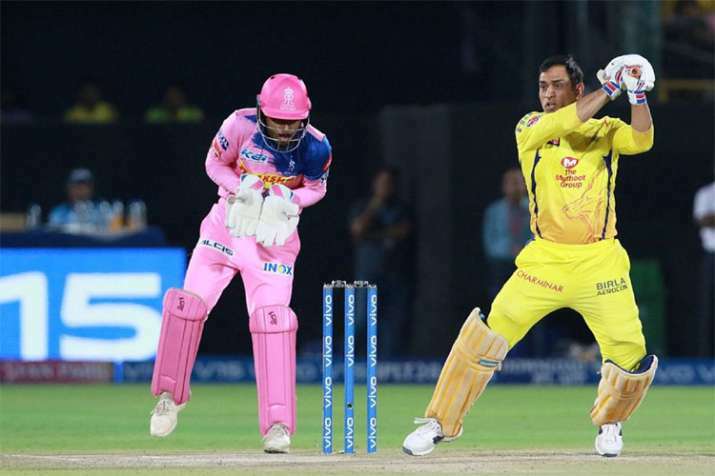 Highlights, RR vs CSK, IPL 2019: CHENNAI SUPER KINGS WIN BY 4 WICKETS! * Unbelievable scenes here at the Sawai Mansingh Stadium in Jaipur! Mitchell Santner, you beauty! He has come into the team and taken his team across the line when he was given the opportunity. That is the might of this side, some one or the other always ends up putting their hands up and taking Chennai to victory! 23.48 IST: Ben Stokes to Mitchell Santner, SIX! And Santner finishes it off in style! What a stunning victory. Stunning. Chahar rushes out in ecstasy to celebrate with his mates. Incredible scenes out there in the middle. Santner gets this full ball in his arc and he lofts it high and handsome over the long on fence for a biggie. CHENNAI WIN BY 4 WICKETS! 23.44 IST: Ben Stokes to Mitchell Santner, Wide. 23.42 IST: Ben Stokes to Mitchell Santner, No ball! Or is it? The umpire signals it, but then the square leg umpire says that isn't the case. The batsmen take two as Santner mistimes the pull off the high full toss towards mid-wicket. I'm seeing this for the first time here. Dhoni, from the dugout, has come out in the middle to talk to the umpires. In the end, the no-ball isn't given. A double is taken. * Mitchell Santner walks out to bat with 8 runs needed off 3 balls. 23.40 IST: Ben Stokes to MS Dhoni, OUT! When the time's come to step up, Ben Stokes isn't one to shy away. What a comeback delivery. Inch perfect. Couldn't be any more perfect and he needed that as there's no margin for error against someone like Dhoni. The Englishman comes charging in and fires in the yorker on middle, Dhoni makes room to smash this but can't do anything about it as the stumps are rattled. 23.39 IST: Ben Stokes to MS Dhoni, Takes the pace off this one as he bowls it on a back of a length, Dhoni slaps it down to long on and despite his struggle to run, he completes two runs. 8 needed off 4 now. 23.38 IST: Ben Stokes to Ravindra Jadeja, No ball! That's a Free Hit! Not looking good for Rajasthan here. Stokes oversteps as he bowls a back of a length ball well outside off, Jadeja slaps it to sweeper cover and gets to the other end. 23.37 IST: Ben Stokes to Ravindra Jadeja, SIX! That's a ridiculous shot. What power from 'Sir' Jadeja. Stokes is stunned, we're stunned! Spectacular. Full and wide outside off, Jadeja reaches out, throws his bat wildly at it and falls over to the ground as he hammers it down the ground. It clears the fence and that's a maximum. * Ben Stokes to bowl the final over of the game. He has 17 runs to defend. * Dhoni is down on his haunches. Really being pushed fitness-wise, and the heat isn't doing him any favours. Slight halt in play as the physio comes out to stretch him out a bit and he'll use this chance to get some fluids in too. So will the other players on the pitch. 23.30 IST: Jofra Archer to MS Dhoni, Another two. Fifty up for MS Dhoni, his 22nd in the Indian Premier League. This length ball is punched through point and the batsmen come back for the second. 23.28 IST: Jofra Archer to MS Dhoni, Dhoni will feel he's missed out. High full toss on the pads from over the wicket, the batter works it through backward square leg. Runs the first one hard and comes back for the second. * Ravindra Jadeja walks out to bat at number 7. 23.22 IST: Ben Stokes to Ambati Rayudu, OUT! Ben Stokes with the breakthrough. Makes sure that the 95-run stand comes to a close at the most crucial of times. Cleverly disguises the slower one as he bowls it on a back of a length. Rayudu backs away and pulls it high over mid-wicket. Gopal out in the deep runs back and takes a sliding catch as the ball comes above his shoulder. Superb. Stokes applauds that. Could be the moment that wins Rajasthan the game. Chennai still need 33 runs in 14 balls. 23.20 IST: Ben Stokes to MS Dhoni, FOUR! Much-needed for Dhoni and Chennai. Short ball into the body, the Chennai skipper swivels inside his crease and pulls it aerially through backward square leg for a boundary. * Ben Stokes to bowl now. 23.17 IST: Jofra Archer to MS Dhoni, Ouch! That pings off the helmet! A bouncer on middle, Dhoni did not expect that and before he could react, gets hit on the helmet. The ball lobs towards the keeper and a leg bye is taken. No reaction of any pain from MS though, as calm as ever. 23.15 ISTJofra Archer to Ambati Rayudu, Excellent ball! In the blockhole and aimed at the base of the batsman, Rayudu misses the ball as he tries to flick and gets hit on the toe. The ball runs fine to the right of the keeper as he was wrong-footed. A couple of leg byes taken. * Jofra Archer is back into the attack. 23.11 IST: Shreyas Gopal to Ambati Rayudu, Low full toss on middle, Rayudu slogs but fails to connect cleanly. A single is taken towards deep mid-wicket. * Shreyas Gopal is back on. 23.08 IST: Jaydev Unadkat to Ambati Rayudu, SIX! A mishit but it clears the rope! Such is the power of 'Bahubali' Rayudu. On a length on middle, Ambati runs down the track and lifts the ball way over wide long on. Huge! Removes the pressure that was building there! * Strategic break. This game is shaping up to be extremely well. Dhoni and Rayudu are scoring the runs, despite Rajasthan's efforts to contain them. The visitors will need much more though. The ball very much in the hosts' court, but anything can happen with MS Dhoni still there. 22.57 IST: Ben Stokes to Ambati Rayudu, Huge appeal from Stokes but that is surely missing leg stump. A length ball on middle and leg, going straight down with the angle. Rayudu misses his flick and gets rapped on the thigh pad. A leg bye is stolen. 22.56 IST: Ben Stokes to Ambati Rayudu, SIX! That is a brilliant shot! Excellent thinking and reading of the slower ball. Wide outside off, Rayudu tracks down the wicket and reaches out before smashing it way over long off for a biggie. * Shreyas Gopal with a change of ends. 22.48 IST: Jofra Archer to MS Dhoni, Big mix-up in the middle. Could have been gone, but Rayudu survives. Dhoni taps this length ball down in front of point and Ambati is off in no time. He's sent back, as Stokes is quick to get to the ball. He fires a throw at the bowler's end, but misses. 22.45 IST: Riyan Parag to MS Dhoni, SIX! It bounces just on the rope. Lovely shot from MSD. He picks his spot and dispatches it perfectly. Full, fast and flat on off, Dhoni kneels down and unfurls the slog sweep. Gets it off the middle and he hits the boundary rope. A flat hit. 22.42 IST: Shreyas Gopal to Ambati Rayudu, Shorter in length once more, on the stumps, Rayudu goes deep inside the crease and whips it to deep mid-wicket for a single. 11 off the over, a productive one for Chennai. They need 102 to win off 60 deliveries. 22.33 IST: Riyan Parag to Ambati Rayudu, In the air but it's just wide. The ball sticks off the surface as Parag gives it some air. Rayudu is early into the shot and ends up chipping the drive, just wide of extra cover to his fortune. It rolls down to long off and the batsmen take two. 22.30 IST: Shreyas Gopal to MS Dhoni, Flat, short and in line of the stumps, Dhoni skips out and helps the pull behind square leg. The man in the deep mops it up as the batsmen cross over. 22.26 IST: Riyan Parag to MS Dhoni, On the leg stump line, it's paddled fine down the leg side for a couple of runs. * Riyan Parag into the attack now. Perfect time for the debutant to come on and show what he can do. * Archer is into the attack. 22.16 IST: Dhawal Kulkarni to Ambati Rayudu, SIX! Pressure releaser! The pressure was mounting massively on Rayudu and Chennai as there were 3 dot balls prior to this one. This ball is on length and Ambati comes down the track before lifting it over long on for a maximum. 22. 14 IST: Dhawal Kulkarni to Ambati Rayudu, Excellent fielding! A length ball on middle, Rayudu comes inside the line and looks to flick it through mid-wicket but Smith there stops the ball with a committed effort. * Kedar Jadhav is the new batsman in. 22.13 IST: Jaydev Unadkat to Faf du Plessis, OUT! Du Plessis will have to walk off now! A length ball on middle, he looks to pull it over deep mid-wicket but fails to time it well as it hits him high on the bat. It flies to deep mid-wicket where Tripathi covers good ground and holds on for an excellent take. 22.10 IST: Jaydev Unadkat to Faf du Plessis, Excellent effort in the deep from Tripathi! Saves a run for his team. A length ball on middle, du Plessis lofts it over mid-wicket. Tripathi from square leg runs to his left and covers a long distance before putting in a full-length dive and pulling the ball inside. Replays show he has done well and saved a run for his team. 22.08 IST: Jaydev Unadkat to Ambati Rayudu, Direct hit but Rayudu is in! A length ball outside off, Rayudu pushes it towards mid off and sets off immediately. Buttler at mid off picks up the ball and scores a direct hit at the bowler's end. Excellent fielding but the batsman is well inside. 22.06 IST: Jaydev Unadkat to Ambati Rayudu, Back of a length outside off, Rayudu can only push it towards extra cover as the ball hits him high on the bat. 22.04 IST: Dhawal Kulkarni to Faf du Plessis, Faf feels he missed out there! A length ball on the pads, du Plessis looks to run it down fine on the leg side but finds the short fine leg fielder. Easily could have been a boundary. 22.03 IST: Dhawal Kulkarni to Faf du Plessis, On the pads, flicked away to deep square leg for a couple of runs by du Plessis. * Ambati Rayudu is the new man in. 21.58 IST: Jaydev Unadkat to Suresh Raina, FOUR! Smacked! Raina does not even need to look at it after hitting the ball. Such was the conviction. A length ball outside off, the southpaw makes room and hits it through the covers uppishly but in the gap. The ball races away to the rope. 21.56 IST: Jaydev Unadkat to Faf du Plessis, Beaten! A length ball outside off, du Plessis looks to feel for the ball but fails to put bat on ball. It swings away at the last moment and goes just inches past the outside edge! * Jaydev Unadkat to bowl from the other end. * Suresh Raina walks in at number 3. 21.50 IST: Dhawal Kulkarni to Shane Watson, Nearly gone first ball! A length ball outside off and some away movement, Watson looks to feel for the ball but it whizzes past his outside edge! Rajasthan would love that early wicket here. * We are back for the chase. 152 to win, the two Chennai openers out in the middle are Faf du Plessis and Shane Watson. The home side fielders are in position as well, while the new ball is in the hands of Dhawal Kulkarni. Will Rajasthan be able to defend their total or will Chennai romp home? Time to find out! * Ravindra Jadeja who is up for an interview says he is very happy with all his wickets in international cricket and he is enjoying his game. Further adds he is feeling great to be playing against his first Indian T20 League team. Mentions the crowd here is fantastic. He hopes they can continue the momentum and end on the winning side. States he wanted to get Smith out as he was looking for wickets and he did manage to get him. Ends by saying they have variety in their bowling and they did a good job today. * It was mostly Chennai through the innings, but that last Shardul Thakur over, which went for 18 runs, could just be the psychological edge Rajasthan need in the second half of the innings. The hosts got off a fast start with Buttler and Rahane firing away, but they kept losing wickets at regular intervals. After a point, the away side was on top, right up till the point where Thakur conceded 18 runs, with Gopal hitting the bulk of them. 21.34 IST: Shardul Thakur to Jofra Archer, A single to end! 18 from the over. A top nut to end. Not sure why he did not bowl this earlier. A yorker on middle, Archer jams it out towards covers for a single. 21.34 IST: Shardul Thakur to Jofra Archer, FOUR! Archer gets into the act now! 150 up. 17 from the over with one ball to go. Another freebie. Short and on the body. Archer swivels and pulls it over the short fine leg fielder for a boundary. 21.33 IST: Shardul Thakur to Shreyas Gopal, SIX! Gopal is turning on the heat here. What a cameo this is. 12 from the first three. Poor bowling though to be honest. With mid off up, this is right in the arc. Full and on off, Gopal lofts it over mid off. This time the connection is such that it carries all the way. Three balls to go, can they make it a 20 run over? 21.31 IST: Shardul Thakur to Shreyas Gopal, FOUR! 6 from the first two balls. A very good shot this. Gopal slaps this length ball on off over the bowler's head and it races to the fence. 21.30 IST: Shardul Thakur to Shreyas Gopal, Good fielding by Santner. Gopal lofts this over covers. Santner makes good ground to his right and the manages to push it back in. Saves two for his side. 21.27 IST: Deepak Chahar to Shreyas Gopal, FOUR! Up and over! Handy boundary, they would love a few more. Gopal makes room and picks the slower one. He waits for it and then lofts it over the mid off fielder. It bounces just before the ropes. * Deepak Chahar to bowl from the other end. 21.19 IST: Shardul Thakur to Ben Stokes, Brilliant fielding! Excellent commitment by Faf! He makes up for the misfield early on. Stokes smashes this down towards the long on fence. Du Plessis makes a lot of ground to his right, dives and saves two. 21.18 IST: Shardul Thakur to Ben Stokes, Archer was a goner! A risky run that! Stokes makes room and pushes towards sweeper cover. They take one, Stokes wants a second. Rayudu there throws it to the bowler who does not collect it. Had he done so, Archer was way out. 21.17 IST: Ravindra Jadeja to Jofra Archer, A dot to end another excellent over and a fine spell by Jadeja. He has taken two wickets and given away only 20 runs. He bowls this on the stumps and Archer keeps it out. * Strategic break! Rajasthan has not been able to pull away at all. They have been pegged back by wickets at regular intervals and despite most of their batsmen getting starts, they have not been able to convert them. Chennai, on the other hand, will be very happy with the way things have gone and would love to finish well with four overs remaining. The hosts, though, would like Stokes to smack a few out of the ground and take them as close to 150 as possible! Meanwhile, it is Jadeja to bowl after the break. 21.12 IST: Imran Tahir to Ben Stokes, NOT OUT! Archer is well in! A handy couple for the hosts. This is full and Stokes pushes it to the right of long off. They take one and then go for the second. The fielder fires a very good throw to the bowler who collects it and appeals. The umpire takes it upstairs and replays show that Archer has made it in. An expensive last over by Tahir. 10 from it. He goes wicket-less today as he finishes with figures of 4-0-28-0. 21.09 IST: Tahir to Stokes, FOUR! Reverse sweep and it comes off! Stokes holds the key here. Stokes is down one one knee and hits it through short third man. It races away. 21.06 IST: Shardul Thakur to Riyan Parag, OUT! The debutant's start has come to an end. A bit of a loose shot, really. It's a bit short and well outside off, Parag moves a step across and looks to heave it over the leg side. Only manages an edge behind which Dhoni takes comfortably. 21.04 IST: Shardul Thakur to Ben Stokes, WIDE! 100 up for Rajasthan. It has been hardwork for the batsmen. Bowls short and outside off, Stokes looks to chase that but misses it. 21.00 IST: Imran Tahir to Riyan Parag, FOUR! Could have easily been a caught and bowled. Tahir got wrong footed there. It is short and on middle, the ball seems to stop in the surface. Riyan looks to check his shot but till then the ball hits the bat. Goes to the right of Tahir who is moving to his left. The long on fielder too can't stop it and it results in a boundary. Second in the over. 20.59 IST: Imran Tahir to Riyan Parag, FOUR! Full toss and it has been put away! Good shot picked the spot nicely. On the pads, Riyan flicks it over the mid-wicket fielder. No one in the deep and a boundary. Much-needed one. 20.57 IST: Mitchell Santner to Riyan Parag, Flighted delivery on middle, Parag tucks it towards the leg side for a run. * Mitchell Santner is back into the attack. 20.52 IST: Imran Tahir to Riyan Parag, Floated on leg, Parag flicks it towards square leg for a run. 20.46 IST: Imran Tahir to Steven Smith, Floated on middle, Steven drives it towards mid on for a run. * Imran Tahir is on now! * Strategic break! Rajasthan have been jolted not once, not twice but four times after being asked to bat first despite a flurry of boundaries at the start. The batsmen have played one shot too many and in the process, lost their wickets. Ben Stokes has walked out and joined Steven Smith in the middle. Chennai are well on top here and now will know that if they separate the Aussie-English duo of Smith and Stokes, they can dictate terms even further. The hosts, on the other hand, will need a big stand here. 20.40 IST: Ravindra Jadeja to Rahul Tripathi, FOUR! Misfield! From another man who does not do it often, Faf du Plessis. Tripathi plays a very good shot against Jadeja. He goes inside out over covers. Faf runs to his left, dives and looks to stop the ball but pushes it onto the ropes. 20.37 IST: Mitchell Santner to Rahul Tripathi, DROPPED! You do not see Dhoni drop these quite often. he just could not grab hold of it. This is fired in on off, it pitches and turns away. Tripathi looks to play it very late but ends up getting a faint outside edge which Dhoni fails to hold onto. 20.33 IST: Ravindra Jadeja to Steven Smith, Tossed up on middle, Smith flicks it through mid-wicket for a single. * Ravindra Jadeja is on attack now. * Steven Smith is the new batsman in. 20.20 IST: Shardul Thakur to Jos Buttler, FOUR! Three in the over and four consecutive ones! Poor delivery this! It is down the leg side. Buttler just helps it on its way to the fine leg fence. 20.18 IST: Shardul Thakur to Jos Buttler, FOUR. 20.17 IST: Shardul Thakur to Jos Buttler, FOUR! Welcome into the attack, Thakur! It is raining boundaries here. A short ball and on the body, Buttler goes deep inside the crease, gets on top of the bounce and pulls it to the fine leg fence. Chahar looks to stop it with a dive but fails to. He seems to have hurt himself in the process. * Shardul Thakur is into the attack. 20.15 IST: Deepak Chahar to Sanju Samson, FOUR! That has been creamed! Chahar bowls it slightly short and Samson picks the length early, he goes back and nails the pull shot. It races to the square leg fence. Off the mark with a boundary. * Sanju Samson is the new batsman in. * Review time! Chahar feels he has got Rahane LBW, the umpire feels different. Deepak convinces his skipper to go for the review and Dhoni does so. 20.10 IST: Deepak Chahar to Ajinkya Rahane, FOUR! Excellent placement! Slightly short and outside off, Rahane stays back and punches it through the gap in the cover region. Dealing in boundaries are Rajasthan. 20.09 IST: Mitchell Santner to Ajinkya Rahane, FIVE WIDES! The start keeps getting better for Rajasthan. The pressure telling on Santner. He fires this one down the leg side, Rahane looks to sweep but misses. Dhoni fails to collect the ball behind and races to the fine leg fence. 20.07 IST: Mitchell Santner to Ajinkya Rahane, FOUR! First boundary for Ajinkya Rahane. Tossed up on middle, Rahane comes down the track and flicks it over mid-wicket for a boundary. * Mitchell Santner to bowl from the another end. 20.03 IST: Deepak Chahar to Jos Buttler, FOUR! What a shot to get off the mark! Takes a few steps ahead and then flicks it right off the middle and past the diving square leg fielder for a boundary. Lovely timing thereby Jos the boss. 20.01 IST: Deepak Chahar to Ajinkya Rahane, Straightaway, Rajasthan are underway! Chahar looking for some shape away starts off on the leg pole. The ball though goes straight on. Rahane looks to flick but misses. The ball hits the pads and rolls towards square leg. A leg bye taken. * We are all set to begin. The Chennai players are out in the middle. Jos Buttler and Ajinkya Rahane will open the batting for Rajasthan. 19.52 IST: Chennai skipper, MS Dhoni, says that they will bowl first because the wicket remains good and it is difficult to defend here. He reckons that there is plenty of room for improvement especially in the fielding department and also in the match awareness. Informs that they have a couple of changes with Mitchell Santner and Shardul Thakur coming in. 19.44 IST: Rajasthan skipper, Ajinkya Rahane, says they were also looking to bowl first. This one looks a different wicket and he believes it will remain the same through the game. He is not sure about the dew and he hopes his team can play well here. States they will look to play freely and play their best. Ends by saying that Samson is fit and back, Riyan Parag is making his debut and Unadkat is back. 19.31 IST: Chennai Super Kings win the toss and opt to bowl against Rajasthan Royals at Jaipur. 19.24 IST: Captain Cool MS Dhoni showing off his football skills ahead of the match. 19.15 IST: The battle in Jaipur is between two cool-minded captains. Match 25 of the #VIVOIPL wherein the @rajasthanroyals are all set to take on the @ChennaiIPL in Jaipur. 19.11 IST: Both teams have arrived at Sawai Mansingh Stadium, Jaipur. The toss will take place at 07.30 PM IST.